Until recently I thought of quinoa only as a dinner or lunch option. Although you might not be sure how to pronounce it many of you have probably heard of quinoa. It has been featured on Dr. Oz, Whole Living Magazine, and many other credible nutritional health sources. So what’s all the buzz around quinoa? Quinoa is a complete protein meaning it contains all nine essential amino acids your body needs. This makes it a great choice for our vegan 7 day challenge and for vegetarians in general. I’ve said before that I like to try to start my day off with protein and fiber. I added fruit to the quinoa along with almond milk, sliced almond, pitted cherries, psyllium husks and drizzled it with honey. It was a really light breakfast but it kept me full through my morning hike with my dog and through my morning workout! Preparation: Mix all ingredients in bowl and Serve. If you want it hot pop it in the microwave for 30 seconds and enjoy! I have great news for all my lovely followers, I order a lot of products from iherb.com. They have great prices and free shipping on orders over $20. Their prices beat out a lot of the popular health food stores, and now you can add to the savings! Use my coupon code OZI624 when your checking out and you’ll receive $5 off your first order! 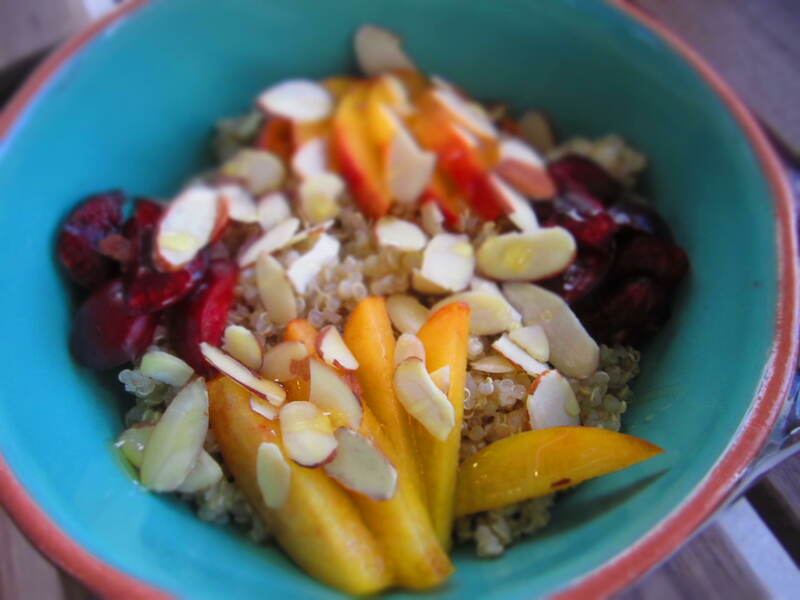 This looks lovely, I’ve always wanted to try breakfast quinoa! Is the almond milk essential or could you just cook it with water? It’s quite expensive near me, so I was wondering if plain quinoa with cinnamon and fruit would work just like porridge? I put cinnamon and whatever fruit I have lying around in mine and it’s delicious! Awesome idea Elizabeth, I’ll have to try that!